Haley George is new to the NVSC staff. Haley started playing at the age of 6 and played competitively all the way through her senior year of high school, playing for some of the top clubs in the state. 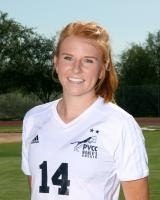 Haley is a current student-athlete at Paradise Valley Community College. This past collegiate season, she was a member of the PVCC women's soccer team that won the NJCAA National Championship in November. Coach Haley has been part of the KinderKicks staff this past season and is now taking on a role on the Academy staff. Her knowledge of the game and enthusiasm makes her a great coach!